The circuit shown here is of a simple 0 to 9 display that can be employed in a lot of applications. The circuit is based on asynchronous decade counter 7490(IC2), a 7 segment display (D1), and a seven segment decoder/driver IC 7446 (IC1). The seven segment display consists of 7 LEDs labelled â€˜aâ€™ through â€˜gâ€™. By forward biasing different LEDs, we can display the digits 0 through 9. Seven segment displays are of two types, common cathode and common anode. In common anode type anodes of all the seven LEDs are tied together, while in common cathode type all cathodes are tied together. The seven segment display used here is a common anode type .Resistor R1 to R7 are current limiting resistors. IC 7446 is a decoder/driver IC used to drive the seven segment display. The clock can be given to the pin 14 of IC2. D1 must be a seven segment common anode display. All ICs must be mounted on holders. how to clock pulse to the IC2 7490 and give any other alternative method is available for provide clock pulse? I have a question is how to give clock pulse in that IC2 7490. instead can i give 5v dc supply???? answer me or give any alternative answer for my question. sir will u plz ans my question. What are the applications of 0 to 9 static display?? for each pulse input the counter will advance by one. that is the indication will advance 0,1,2,3….9 for each pulse in. use the carry over of 7490 to next (10s) counter then it will read from 00 to 99. The application is unlimited. Say number of people passing a check post, no of bottles or any item passing through a conveyor etc, by using suitable sensor like micro switch, optical or proximity sensor etc. hello for each pulse input the counter will advance by one. that is the indication will advance 0,1,2,3….9 for each pulse in. use the carry over of 7490 to next (10s) counter then it will read from 00 to 99. The application is unlimited. Say number of people passing a check post, no of bottles or any item passing through a conveyor etc, by using suitable sensor like micro switch, optical or proximity sensor etc. @ ijaz these are the current limitation resistor for 7segment the maximum rating of current is 10ma. If we use large value of resistor then our 7 segment Brightnss will be low. Sir why we use R1 to R7 = 220ohm resistors in this ckt………? Can we use the other resistors which have different values. e.g (R1 to R7 = 1kohm, 50ohm etc;) except R1 to R7 = 220ohm. Well, you can use. But remember as you keep increasing the resistor value the brightness of the display keeps decreasing. And yes, decreasing the resistor value below 220R will increase the brightness but will also damage the display. Hope you get this. BTW, read some good basic electronics. hi sir, my question is same as louie. This o to 9 counter is well but wht should we do if we need to implement a more than one digit counter ? Hi Priyank input pulse is given to Pin14 of the IC to count. each pulse it will move to next number in ascending order. You can use apush to on switch connect between 5volt and Pin14. for each push the number will advance. it is necessary to give clockpuls to corcuit ya we give inplace of clockpuls a 5v of batttery??? 1.Why is it that you didn’t use a encoder?usually there is an encoder before the decoder. 2.How did you compute the values of the resistor? 3.What is the use of the asynchoronous decade counter?Does it really need to be asynchronous? 4.What should be the clock that i will use here?can i use a 555 astable multivibrator circuit to provide the BCD input?? PLEASE REPLY..THANK YOU VERY MUCH SIR and to anyone who can help me..THANKS! hi guys., pls help me,.i want to build an up and down counter using 1 digit seven segment display,.can somebody sends me a circuit that counts from 0-9 then will reverse. and the switch to be used is a sensor,. As you said, when i take carry from pin 11 i.e,QD then there is a count for numbers 8 (1000) and 9(1001) and i want a carry when the counter counts (0000)to initiate next counter. Thanks a lot! . . . this ckt surely help me build a coin operated timer for a Inet CAFE. 1. Output QA is connected to input B for BCD count. So, if i want to construct a bcd clock..
How to reset it after 6 counts? I mean i have 6 7490ic and wanna build a bcd clock..
Hi Anish take carry signal from pin-11 of first divider to pin 14 (input) of next counter’ to achieve 0 to 99 count. How can we generate carry in the 7490 after the count of ten to start the counting of another display? for example, to build a counter to count from 0 t0 60 used for building binary clock? Hi Amiri use CD4029 instead of CD4017. CD4029 is an up / down counter. Hi you guys. What I’m wondering is how to get the 7490 to reset to 1 instead of 0. I got two 7-segment displays that reset to zero after they reach 12. 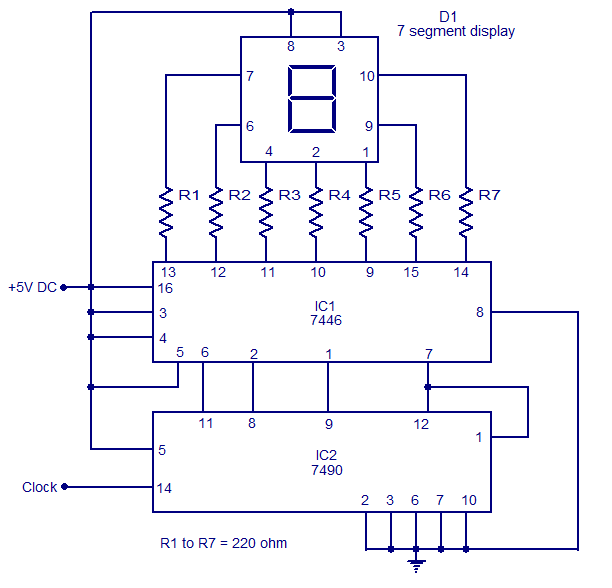 Another group is trying to get their two 7-segment displays to reset after 60.
i’ll try it and send you the comment…. Hi Vasanth each positive going pulse to the input pin 14 will add 1 to indicated number. say if it was at 4 with one positive going input pulse it will change to 5 it will count up to 9 and reset back to zero. you can simply produce pulse through a 10k resistance connected bet ween positive and pin 14 of the IC through bell push switch. each push will add one to the displayed digit. how can i give clock pulse to this circuit? if there any another circuit for that clock pulse, please provide me the details….